Displayed in the photo on the right is a mag­netic storm radi­ating out from the surface. 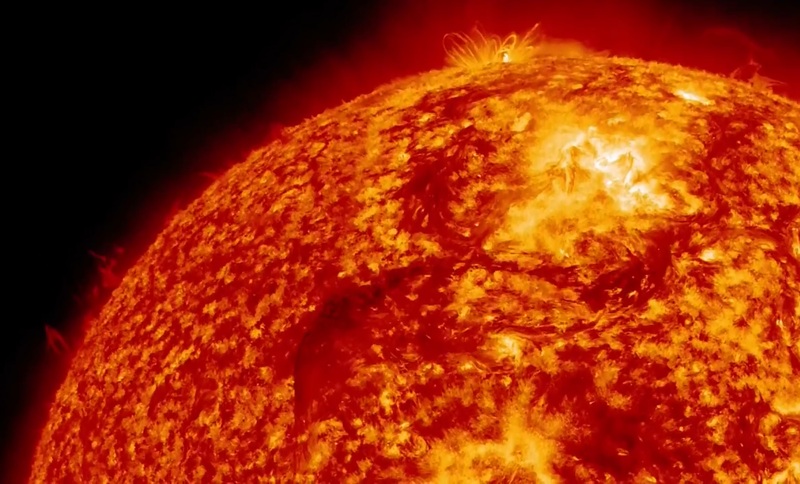 The intensity of this and other types of solar storms recur over periods of years, decades, centuries, and millennia, as well as over billions of years (NASA/JPL). Imagine having a miniature Sun here on Earth that produced enough energy for everyone on the planet and for the life of the planet. Developing sources of con­tinuous, safe, and inexpensive energy is the fundamental need for planet Earth in the 21st-century. Perhaps, we can look to the heavens for a solution. 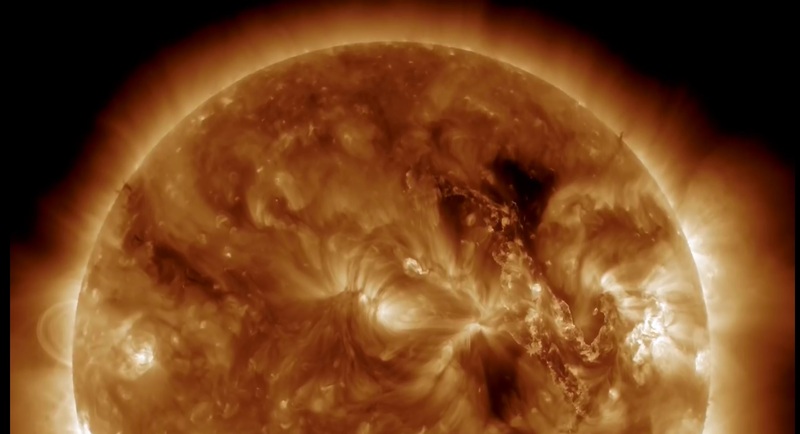 The Earth is continually show­ered with radiation from the Sun and from sources in outer space. 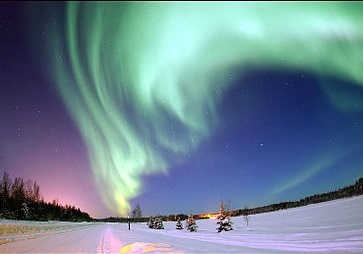 This shower of radiation helps to keep the Earth warm enough to support life, as well as brightening terrestrial skies with magical displays of the Aurora Borealis (inset) and the Aurora Australis. Our Sun and every star in the Universe has something to teach us about producing energy here on Earth. As we explore and seek understanding of how stars shine brightly for billions of years, the dream of plentiful energy for everyone on the planet will most assuredly become reality, someday. 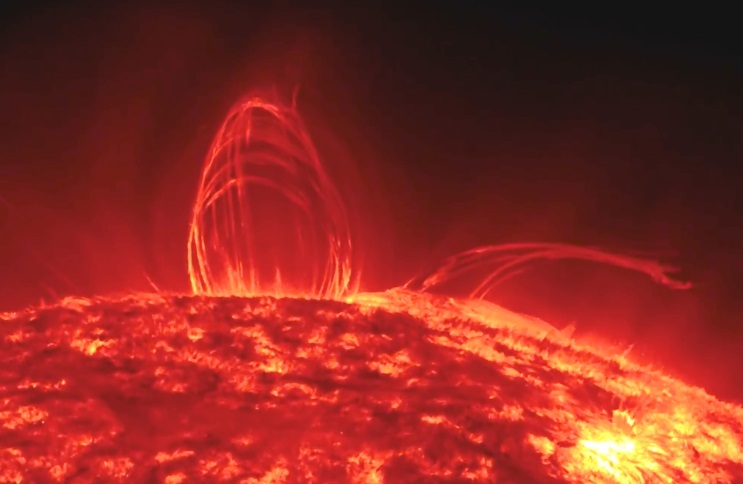 Several solar events that may or may not bear on our search for energy include magnetic storms, the 11-year sunspot cycle, the periodic magnetic-field polarity reversal, and the Sun's rotation. The image of the Sun (above right) reveals a circular formation jutting out of the Sun's surface, which is representative of a medium-sized magnetic storm. When these storms occur, they eject large amounts of high-energy radiation at many wavelengths. Much of the time, these solar outbursts shoot into space and have little interaction with Earth, but they do occasionally shoot radiation in the direction of Earth, wreaking havoc on satellite communications, on electric-power grids, and on weather conditions. Sunspots have not appeared during the summer of 2015, which may indicate a decline in sonspot activity over the next decade. One hypothesis is that global warming and cooling correlate with more or less sunspots. Another solar event that affects radio and satellite communications is the Sun's periodic display of dark spots, referred to as "sunspots" (NASA). When sunspots appeared in low numbers, around the turn of the 17th century (1645 to 1715), Earth experienced below average temperatures, the Ice Age. At times in history when sunspots are unusually numerous, Earth's weather tends to be warmer. Recent sunspot activity seems to be declining. The question then becomes, "will the Earth begin to cool off?" See the chart, also posted at "vencoreweather.com/". The theory of how stars produce energy is fairly well understood, but much engineering work needs to be done to apply the theory here on Earth. In the simplest case, stars create enormous amounts of energy for billions of years by converting two atoms of "heavy" hydrogen to one atom of helium, a process known as nuclear "fusion". Heavy hydrogen has one neutron, as well as one proton, in its nucleus and is less abundant than common hydrogen, which also has one proton in its nucleus, but has no neutrons. The process of fusing two atoms of heavy hydrogen is one reaction among many other possible reactions, but without trekking through a lot of intricately nuanced physics, the idea is well represented by the heavy-hydrogen example (shown in the figure below). Several forms of hydrogen exist. The most abundant form is 11H, having only one proton but no neutrons in its nucleus, plus one orbiting electron. Far less abundant is non-radioactive "heavy hydrogen", also known as "deuterium" (21H). Heavy hydrogen has one proton and one neutron in its nucleus and also has one orbiting electron. As early as the 1920s, theoretical physicists proposed the nuclear fusion process as the source of solar energy. 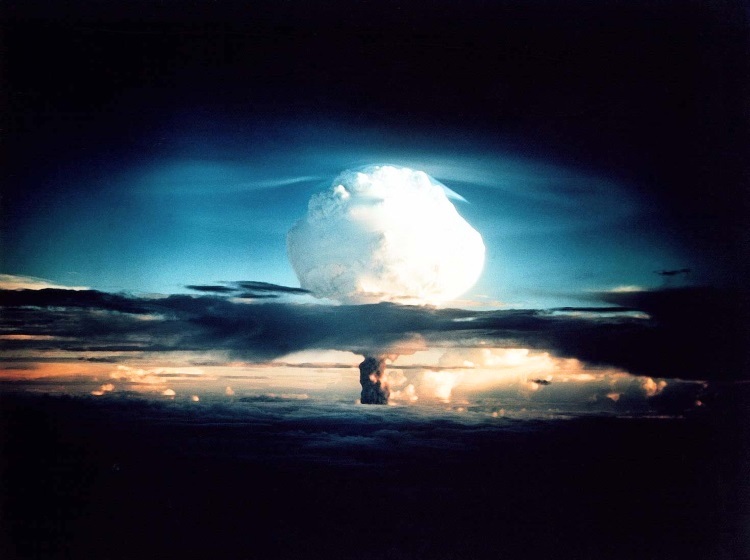 The first earthly thermonuclear (fusion) reaction occurred in 1952, which verified the theory of nuclear fusion. One can say that the basic reaction is quite simple, and that is true, but decades of time have passed and an army of multi-disciplined scientists and a lot of engineering talent from around the world have been trying various schemes to imitate the Sun's miraculous talent of slowing down the conversion of hydrogen to helium to produce a controllable, continual source of energy. Fission breaks apart ("decays"), producing a lot of energy; for example, a fist-full of very highly enriched uranium can power a small town or a submarine for, perhaps, a decade or more. Fusion combines, producing as much as a thousand times more energy than does fission, depending on the substance being used as fuel. Many of nature's elements that are lighter than iron (i.e. below atomic number 26, Fe) can be fused to produce energy. Although partially successful after many decades of intense experimental research, challenging engineering problems persist. Various architectures and techniques have been applied over the years to imitate the energy-producing mechanism of the Sun. Progress is continuing with larger and larger super-conducting magnets and more intense laser devices, but producing substantially more energy than these machines consume has not yet been achieved. A student of technology might suggest, however, that "nuclear fusion" is the penultimate solution to many of the planet's woes, particularly in the availability of liquid fuels via electro-chemical reactions and a nearly limitless supply of fresh water via electrolysis. Of added interest is that, if sequestering carbon-dioxide remains an issue in the future, cheap energy can quite easily use waste CO2 in numerous carbon-containing chemical substances, such as vitamins, drugs, plastics, synthetic fibers, and a myriad array of other useful substances. Paradise on Earth is at least plausible, if not achievable. Modern physics sometimes sounds weird, if not crazy. Many scientists outside of the physics community may share a similar view. A relatively small number of unbelievably intelligent souls can grasp this stuff with any degree of confidence. Not everyone on the planet is an Albert Einstein. or a Richard Feynman. To look deeper into the personal life of Albert Einstein, visit "How I See the World". An early classroom lecture by Professor Richard Feynman at Cornell University can be seen on Youtube..
Fission occurs when large, heavy atoms, such as uranium (U), break apart into smaller, lighter atoms, such as radium (Ra), radon (Rn), and lead (Pb), lead being the most stable decay element of uranium. All of these substances occur within the Earth as a result of the decay of natural uranium. The heat generated by the radioactive decay of naturally occurring uranium is what drives volcanic activity, earthquakes, and tectonic movements, i.e. the movement of continents. Naturally occurring radioactive radon gas is present in many city subway systems and in the cellars of many residences around the world. 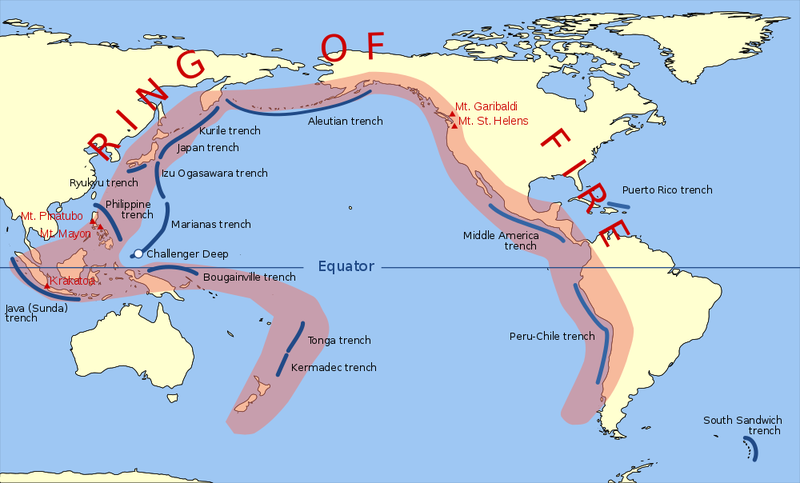 Along the Pacific Ring of Fire lie many active volcanoes and some of the deepest parts of the world's oceans (highlighted in magenta). Earthquakes are quite common along the ring, which is also known as the Pacific Rim. As the de­caying ura­nium trans­forms into light­er and light­er chemi­cal ele­ments, energy is released, much of which is in the form of heat and light. All of the world's operating nuclear power plants currently operate on the fission process to produce heat that changes water to steam, which then turns turbines that drive electric generators to make electricity. Although fission power plants have been operating for many decades, problems do exist. Because of a more plentiful supply of fuel and no radioactive waste, hydrogen-2 fusion appears to be an attractive alternative to fission. Advisement: the hydrogen-2 to helium-4 process produces no radioactivity, while hydrogen-3 to helium-4 does pose a potential radioactive hazzard. The use of "thorium" as a fissionable material has been bandied about for years. Reactor designs exist that produce more fissionable material than they consume; that sounds like "free energy"! In Nature, however, free-lunches do not exist; consequently, tradeoffs must exist somewhere in the system. We at www.rbkor.net intend to explore the use of thorium (to be continued).